<—- WOW!!!!! What a wonderful book!!!! EASILY one of the best books I’ve read this year. Easily a 5 star read (plus? ), in my opinion. And EASILY one of my all-time favorites. I will never forget this one, and what it did to my heart. It put me through the ringer, but perfectly so. Nothing contrived, nothing over-the-top, nothing eye-rolling. Just… good (and bad) emotional perfection. This book was RICH!!!! Rich in realism, rich in intensity, rich in emotion, rich in angst, rich in growth, rich in it’s pacing, rich in it’s eloquent words… Just. Plain. RICH. Sadie: Would like to second (or third or fourth by now) After I Do by Taylor Jenkins Reid. It was so good! It came highly recommended and didn’t disappoint. Pricier than indies and not lendable (got mine from the library) but very good. Sadie: if you are married, it’s a must read! I’ve been on a high all week! Billie: I went on a Goodreads quote liking spree because I can’t stop thinking about this book! Anyone who is married can totally relate to this book and these characters. Easy 5-stars for this one!! Maryse: This will be my next! …and I don’t regret paying that price one bit. Worth every penny, and is exactly what I look for when I want to be consumed by a book. Maryse’s Book Blog: I chose my next book (from my latest TBR LIST), and I’m LOVING it!! 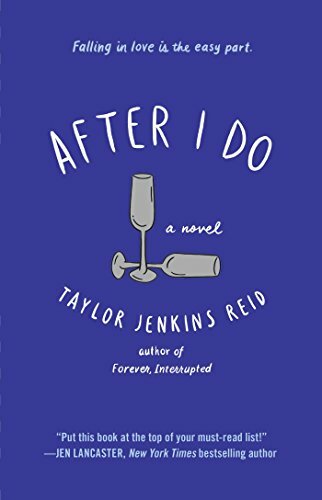 “After I Do” by Taylor Jenkins Reid. So far, wonderfully written and explored and it’s totally breaking my heart. Sooooo real. Powerful. Visceral. Definitely not a bargain book, but I’m glad I one-clicked this one. My heart, though, not so much. Kristi: Maryse, Erin read this and was RAVING about it. She loved it so, so much! Erin: Yay!! Maryse, I LOVED this one. Ugh…I went through so many feelings with them. Maryse’s Book Blog: This one… Ooooof!! Okay u can be my support. Jules: Lover this one too! Susan: I was debating about getting this one but after reading the awesome posts, think I may be one-clicking!!! Stephanie: Worth every cent!! I absolutely loved this book. So emotional…the kind that you feel deep down in your bones because it’s soooo relatable! This one has been with me all week! Maryse’s Book Blog: Ugh!!! Oooohhhhhhhhhhhh! ROAR!! Sorry… Having a “moment”. Still loving. Maryse’s Book Blog: Oh. hehe. Stephanie: This book requires some hand holding for sure! Sadie: Still thinking about it! One of my faves of 2014 for sure. The emails…. Maryse’s Book Blog: Okay you know what!??? OMG I LOVED IT!!!!!!! LOVED!!! 5 stars ohhhh yes! I ended up falling asleep, but with the lights on, and then I woke up, and finished it. Pretty much a straight-shot read for me (unputtdownable except for the part when I finally conked out). But WOW. So happy I read this one!! Maryse’s Book Blog: OH MY GOD YESSSS!!!! I highlighted that with a “WOW!! !” LOL!!!! My gooooodness where did this book come from?!!! I am just blown away by it’s intensity and it’s emotion, and it’s REALISM, and it’s angst but not over-the-top-angst but still… ANGST. And the growth, and the realizations, and it just… it all made so much sense and I FELT it so deep. Sadie: Yes!!! It made me cry. So honest and relatable. It’s no coincidence that I’ve been extra nice to my hubby since last week PS – loved the grandma and brother too. Kodi: Im on page 136, and I have to put it down now. I feel tummy troubles coming on. You might find me in the bathroom for a big portion of the day. With my book! Maryse’s Book Blog: LOL!!!!!! I felt those tummy aches reading this one, too. Oh yes. And butterflies! And more aches. And more butterflies. Pure reading entertainment for those of us that love a good love story, but that enjoy working for it, every step of the way. And I don’t mean that in an arduous or hard read kind of way. Working for this love story isn’t going to exhaust you. It will exhilarate you. Adrenalize you. Excite you and devastate you, and back again (and not necessarily in that order). It is laden in realistic moments. Moments that you can feeeeeel deep inside your heart, and your stomach, along with the characters. That initial crush. That “first kiss”, and the subsequent, hour-long kisses after. That first time. I really didn’t think there was a too soon or too late. I was so confident about Ryan, so confident in myself, that something about it seemed foolproof. As if I could already tell that we were so good together we couldn’t mess it up if we tried. That first I love you. The eventual newlywed bliss. The plans for the future. And then… the married-life issues. Big soul-deep love and turmoil. We don’t say anything. I think of how much I want to scream at him. I think of how I wanted to scream at him last night, too. I think of how much I’ll probably want to scream at him tomorrow. I can only imagine he’s thinking much of the same. And yet the air between us is perfectly still, uninterrupted by any of our thoughts. The stupid stuff. The important stuff. “No, me, too,” I say. But I don’t really know what I’m even sorry for. I feel as if I’ve been sorry for months now without a reason. What am I really doing wrong here? What is happening to us? The resentments. The ultimatums. The rituals. The sweet things that you look forward to each year. The monotonous things that you dread, each day. The giving in. The letting go. The not letting go. And then the letting go… almost completely. All I know is that this might, in fact, be the end of my marriage. It might be the end of something I thought had no ending. But instead, my heart was BREAKING. That is the kind of emotion that this author injects into her characters. They can go from bored and wishing for anything else but this (you’ll feel it, exactly so), to acceptance and even a certain secret thrill at the new changes they are about to embark upon (you’ll feel that too), to utter devastation, and complete sense of loss in the blink of just a few words. Or just a few moments alone. <— and this will just about break you. *oooooofffff* Did you feel that? Punch to the gut, right there. Oh yes. I was crying. So many intense moments like that, my friends (in good and bad emotional ways), but so intense. SO REAL. So that’s all I’m going to say about this one. I won’t tell you how it ends, or the realizations the characters have as they attempt a go at new lives (new futures), but I will tell you it’s pretty much unputtdownable. The sense of family and friends provides comedy amongst the deep moments of pain and desolation. A sense of comedic relief and hope through the moments of alone. My heart is truly broken. And I know that even if it mends, it will look different, feel different, beat differently. From the varying bits of advice (and each one valid in it’s varying truths), to analyzing their own childhoods, to seeing their families with a whole new eye, it seems as if every facet of adult life is tested (and awesomely so). From the bittersweet flashbacks, to the new experiences. The mistakes (past AND present). The truths. The cognizance. It’s stunning, really, what I can do to myself with only a misunderstanding. This story is simply stunning in it’s exploration. The pain and the joy are locked together, tightly bound. It went there. It took risks. It did (and said) things that I wondered if they could recover from. And it did so because it was exploring real issues. Real love. Real life. P.S. This book is one of THOSE. One that has the most (and the best) most relevant, touching, believable, realistic thoughts and quotes, EVER!!!! Whoa! SO crazy to hear THAT. Wow… from emails of *spoilers*… to this. WOW!!! My heart. How exquisitely, poignantly, viscerally worded. P.P.P.S. I have SO many favorite quotes in this, each one equal to me in it’s poignancy but here’s just one more that I couldn’t help but post. No worries, it’s not a spoiler… just so beautifully painful. Such a real thought, and I had to highlight it. That man who stood on the steps of Vernal Fall and told me he couldn’t live without me… I wonder what he’s doing right now, living without me. Holy crap. Wow. That last quote you gave just made my eyes pop out. I know, right?! The WHOLE book is like that. Ahhhhhhh I just… can’t get over this one. I have been saving all of my one-clicks for a 16 hour plane ride I am taking this weekend.. I have a few good options so far but really want to read After I Do. Do you think it will be a good plane read?? Heather, an excellent plane read! Great choice. Beware of public tears though. If you’re okay with that, you’re golden! And you should be ascared. 😉 although soooo worth it! I’m glad it turned out to be such a great read. From the blurbs I can see why they caught your attention. From all these reactions I’m going to have to see if my library has them. You must be a fast reader. I get it. Price-wise and “realistic emotion-wise”, this one is big. But, I’m so glad I didn’t limit myself, for this.. 😉 I loved this book from start to finish. But then again, Maryse—you have never ever steered me wrong! So…..may bite the bullet on this one………..
Okaay I’m one-clicking this pricey book. Man I feel emotional from just the review…have a feeling this book is going to kick my a**. I just bought it. I haven’t read a book in a month! I can’t find time to do it… But I always check your blog and your reviews Maryse, and my TBR list just keeps getting bigger. A 5 star plus book I need to get to right away!!!! My husband and I are celebrating our 9 year anniversary today, I might have to squeeze a little reading time later lol. Hahaha I’m going for it!!!! Should I get the tissues? WOW! With a review like that, how can I pass this up? “This is the saddest moment of my life.” Gaaahhhh, that had me tearing up already and I don’t even know these characters yet! My man and I have been together 26 years, and we finally got married last year and are coming up on our one year anniversary on Monday. We have been through so many crazy times. It’s fun to read the outrageous FSOG kind of stories and escape for a while. But it’s also meaningful and affirming to read a book that feels a little more real with characters or situations I can relate to. Thank you for this review Maryse. I think After I Do just moved to #1 on my TBR list (after I finish Born Of Fury tonight). I am way too chicken to read this one. At least for right now, it has to go on my TBR list. I read too many back to back major heartbreak books a week or so ago and I need a break from the crying. But I’ll never pass up one of your 5 stars. I had tears in my eyes just from your review! I have been in a book slump so it looks like I have to splurge on this one…haven’t read anything lately that had me that emotional… and I’m a little scared now too! Great review as usual! Yes, Maryse… in case someone isn’t following Facebook… 5 stars easily. I wrote my very first review on goodreads for this book too. That’s how much I liked it. No… loved it. No car chases. No kidnappings. No alpha males. Nope. Nada. Just REAL. That’s what I loved. I got completely sucked into it. Every word was so authentic and not forced. It was a very easy read. I have highlights everywhere and I made my husband swear he didn’t hate me for making him go to “I Luv Pho” for Vietnamese food!!! Well worth the price because I know this story will stay with me. I lost sleep over this book last night and hadn’t even started it yet! Started first thing this morning and everything you’ve said so far is right on….. The feelings are intense and I can’t put this book down. Thankfully I am on vacation so I don’t have to! It is a great book! I loved it. I really like books about marriage struggles that are portrayed realistically. Have you read Heart of the Matter by Emily Griffin? I read that one a couple years ago and I still get a lump in my throat thinking about it. I loved this book too. I like that the emotions and problems are real.Its not a fantasy, its real life. I am starting her other book tonight..really enjoyed this author! 65%……sigh. Afraid of how it’s all going to end! I liked this book a lot, not loved but liked. I was reading at one point, put it down and just snuggled with my hubby. It made me so sad at times. Wow, wow, wow! I just loved this book so much! I have been married for 17 years…. have been with my husband since I was 16, so this book was intense for me and so real and so understandable. My feelings were all over the place with this one! Thank you so much for the recommendaton! So worth the money! Great author! I took the $10 plunge. I liked it but I did not love it. Parts I could relate to as I have been with my hubby 13 years. I liked her writing style. With all the hype I guess I just expected the wow factor and I found it lacking. Right now I’m angry at her- she seems like a hypocrite- wanting what you don’t have, but not wanting what you have… I hope it gets better…His emails…crying…. *snort* I had to take Say Something off of my playlists after you linked the video a while back and then someone mentioned *that* scene from Arsen. Remember? “I’m afraid.” *sob* And now After I Do? #@&%$#!!! I just finished this book!!!! I LOVED it!!! This author’s writing style is just amazing. Everything felt real. Thanks for another recommendation Maryse!